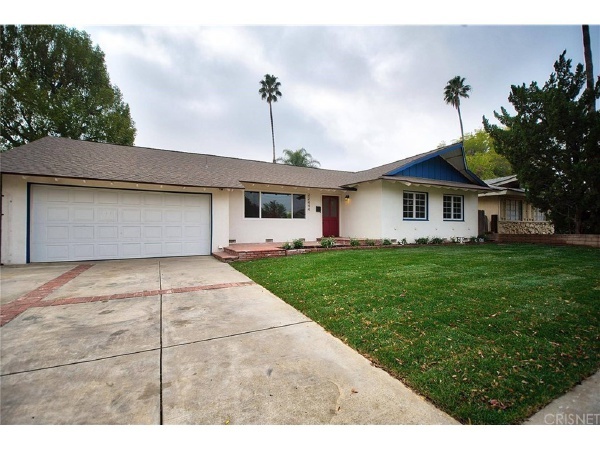 BEAUTIFULLY Remodeled California Contemporary home located on a quiet Cul-de-Sac street. Great Neighborhood, this home is ready for a new family! New landscaping makes for perfect curb appeal. Leading you to a light bright living area with new laminate flooring running through the living, dining room and family room areas. Fresh paint, light fixtures, ceiling fans, newer windows and wonderful brick fireplace round out this lovely home. The kitchen has nice white cabinets, black granite counter tops, large island, tile flooring and tons of storage. Bedrooms have new carpeting and fresh paint. All Bathrooms have been updated with new vanity's, fixtures, and tile flooring. There is also a bonus room with new carpeting and fresh paint, that can be used as a play room, tv room, man cave or endless possibilities. Two car attached garage and nice big back yard. Start packing because this home is move in ready!